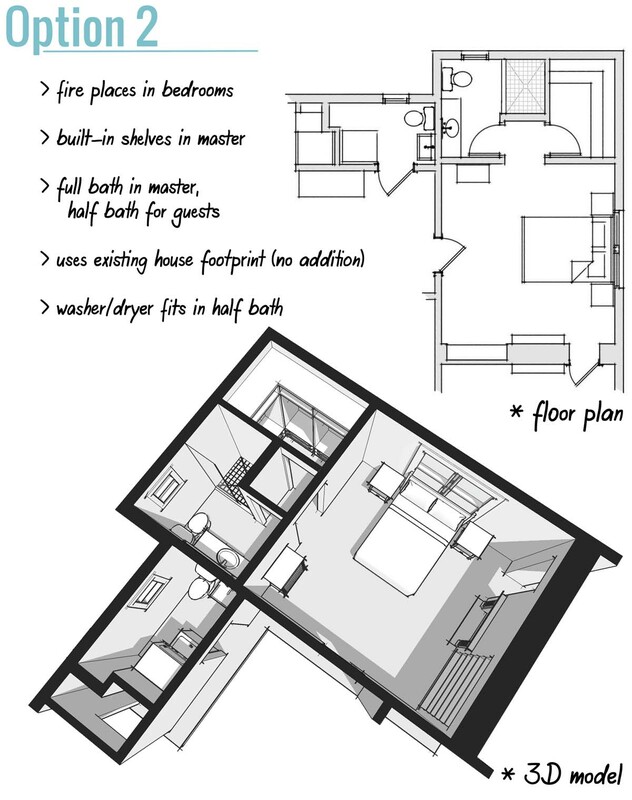 Renovating your home? Building a new addition? We can help. Here’s a little secret. Most people have no idea what architects do. Let alone why they would ever hire one. In this step, we meet with the homeowner and discuss big picture questions. Does your budget match your wishlist? What are your home’s hidden possibilities? Is there a solution that doesn’t require construction? 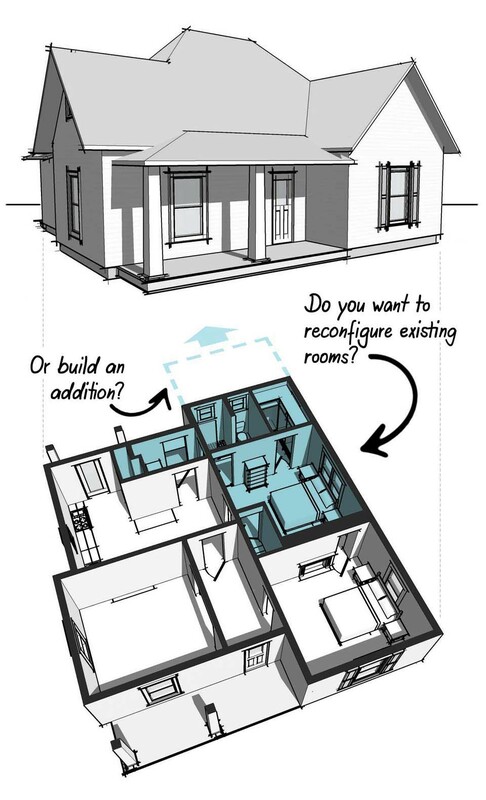 Can you reconfigure or repurpose existing rooms? Can this house meet your needs? Or is it time to move? Sometimes if a client isn’t sure the project is worth pursuing, we’ll enlist the help of a local contractor. We walk them through the scope we defined and request a rough estimate of construction costs. If all systems are go, we move on to the next step. Now the real fun begins. Our next step is to measure and draw your house as-is (we call this the existing conditions) and then show you what it could look like after renovating. We do our best to paint a vivid picture. We’ll bring floor plans and 3-D views or a digital model (because we realize not everyone spends their formative years learning to read blueprints). After a revision or two, the design is settled and we can move on to the next step. By now, we’ve spent a lot of time dreaming up and revising possibilities to create your unique design solution. So the last thing we want is for our ideas to be misinterpreted during construction. 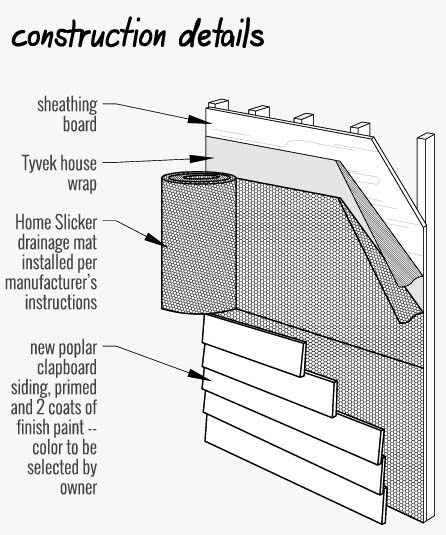 Enter Step 3 – Construction Drawings. What type of lights will we use in the closet and where is the switch located? What’s the dimension of the tile and how does it center on the shower control? What information is required for a permit and zoning review? How far apart are the built-in shelves and how do we make sure they match the woodwork in the rest of the house? Sometimes clients pick a contractor early-on in the process (or they plan to do the work themselves). Others prefer to ask 2-3 contractors for bids or estimates. In Step 3, we tailor what we draw to the builder’s needs. We can help you decide which strategy is best for your job and create construction documents based on that decision. The more we figure out on paper, the smoother the construction process goes. The good news is, most of this information is supplied by the architect (that’s what you’re paying us for). Once the construction drawings are complete, we submit them to the contractor to develop a final price and start building. If you don’t have a contractor selected, we’re happy to help you find one who’s a good fit for the project. 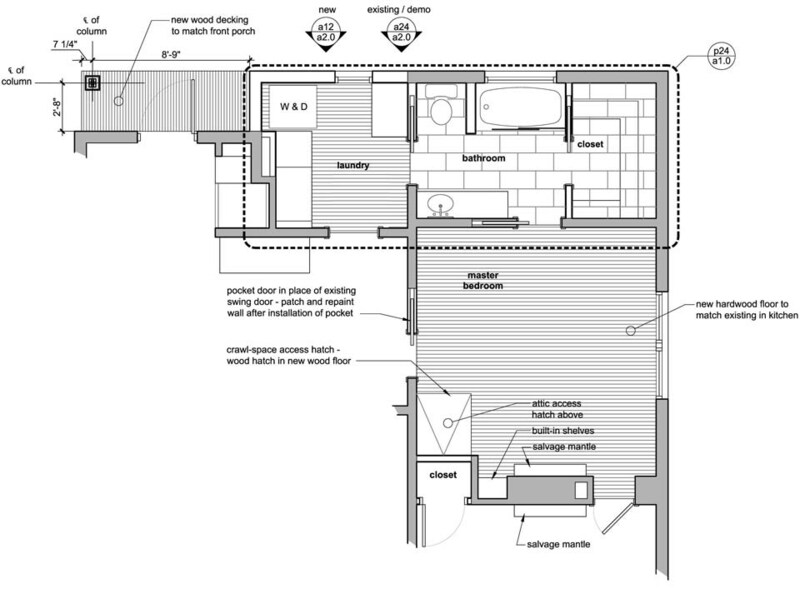 During the construction process, we’re available to translate drawings for the builders when they have questions. We hope this helped answer some questions about the design process. Before you decide whether to work with us, there are a few more things you should know. We’re not for everybody. If you found a pre-designed house plan online and just need a few alterations, we’re not the best fit. Or if you’ve got everything figured out and just need someone to draft it up, you probably don’t need the level of service we offer. Finally, we like fixer-uppers. We specialize in renovations to historic homes and infill housing (new homes built in historic neighborhoods). If you’ve always wanted to renovate an old house but had no clue where to start, or if you’ve found the perfect lot in a historic neighborhood (surrounded by sidewalks and lovely front porches), we can help. Great! Then you probably have two more questions — how long does this take and how much does it cost? Every job is different. The schedule and design fees are based on the complexity, scope, and individual circumstances of each project. But to give you a general idea, here are some examples. The most common rooms that need updating in historic homes are kitchens and master suites. Say you buy an old house with a big, 200 square foot kitchen and a generous, 350 square foot master suite (bedroom + bathroom + closet). You want a new kitchen layout, all new cabinets, bigger master closet with a built-in organizing system, walk-in shower and freestanding tub in master bath, double vanities, an overall improved layout and updated finishes. In Knoxville, a job of this size and scope is probably going to cost between $70,000-$110,000 to construct, depending on who builds it and the quality of finishes and fixtures. Since our job is design and not construction, we do not provide construction cost estimates. Instead, we help homeowners get customized pricing from local contractors. If you’re not ready to talk to a professional, online calculators can be handy for ballpark figures. Try this one for renovations. For new, custom houses, click here. Architectural Fees: $7,000.00 – $11,000. View a sample contract and proposal to see exactly what’s included. Or maybe you’ve purchased a vacant lot and want to build a new, 2,500 square foot home that blends in with its historic neighborhood. In this example, the construction cost is $450,000. For new construction, we put more time and attention into each of the 3 steps. We develop a thorough understanding of your goals and priorities. We present and refine options until we have a custom house design that addresses your individual needs. Then we carefully prepare construction drawings that will help the builder realize your vision. Architectural Fees: $40,000.00 – $50,000.00. Again, each job is different and these are simply examples. But they’ll put you in the right neighborhood if you’re considering a job of similar scope. On behalf of fixer-uppers everywhere, thank you for taking the time to learn what it takes to properly plan renovation and construction projects. Now it’s time to take action. There are beautiful, old houses out there waiting for you to turn them into comfortable, modern homes again. You don’t have to be a DIY expert to make it happen. All you need is a vision and the right team to help you realize it. What’s your project? Contact us today to get started.